WASHINGTON - White House officials said Monday that Deputy Attorney General Rod Rosenstein will stay in his job for now, following a chaotic morning of speculation that he was about to resign - a development that would have further destabilized a Justice Department already under siege because of the Russia investigation. Job insecurity has been a regular feature of Rosenstein's life for more than a year, as the president and his allies have publicly attacked him over special counsel Robert Mueller's probe into Russian interference in the 2016 campaign and whether any Trump associates conspired with those efforts. But his hold on his job never seemed as tenuous as Monday morning, after reports last week that Rosenstein, the No. 2 official at the Justice Department, had suggested secretly recording the president and mounting an effort within the Cabinet to remove him from office. Rosenstein has disputed the accuracy of those accounts, but his denials left plenty of room for interpretation. Multiple officials said that during conversations over the weekend between and among White House and Justice Department officials, Rosenstein indicated that he was considering resigning. During some of those conversations, Rosenstein said his resignation might be warranted to end the controversy, according to people familiar with the discussions, who spoke on the condition of anonymity to talk about internal deliberations. Some Trump aides had counseled the president against quickly firing Rosenstein, arguing that such a move could be exploited politically by the Democrats and would be better done after the midterm elections. Friday night, Rosenstein spoke with White House counsel Donald McGahn, according to a person familiar with the discussions. In that conversation, Rosenstein said he was willing to resign, but McGahn urged him to wait until they could talk further Monday morning, this person said. By Sunday, some senior Justice Department officials had concluded that Rosenstein was about to be out of his job and began planning for Solicitor General Noel Francisco to take over supervision of the Russia probe. As part of that contingency plan, Matthew Whitaker, chief of staff to Attorney General Jeff Sessions, was slated to take over the other responsibilities of the deputy attorney general, according to the people familiar with the discussions. When Rosenstein went to the White House on Monday morning, senior Trump advisers expected him to resign, according to several advisers. A Justice Department official, however, said Rosenstein had no intention of resigning but went there expecting to be fired. As often happens in government, the two sides heading for a high-stakes confrontation decided instead to hold another meeting. "At the request of Deputy Attorney General Rod Rosenstein, he and President Trump had an extended conversation to discuss the recent news stories," White House press secretary Sarah Huckabee Sanders said in a statement. "Because the President is at the United Nations General Assembly and has a full schedule with leaders from around the world, they will meet on Thursday when the President returns to Washington, D.C."
After Rosenstein met with White House Chief of Staff John Kelly, he proceeded to a meeting of senior administration officials, the first indication that, at least for the moment, he was staying on the job. Rosenstein appointed and has been overseeing Mueller, and ousting the deputy attorney general would probably raise concerns that the president or his allies were kneecapping the Russia investigation. One Trump adviser said the president has not been pressuring Rosenstein to leave. The person said Rosenstein had expressed to others that he should resign because he "felt very compromised" and the controversy hurt his ability to oversee the Russia inquiry, said a person close to Trump. Trump's attorney, Rudy Giuliani, said Monday that if Rosenstein is replaced, "they should put a brief hold on the investigation and review it from beginning to end." Rosenstein has been a target of Trump's public ire and private threats for months, but uncertainty about his future deepened after it was revealed Friday that memos written by Andrew McCabe, then deputy FBI director, said that in May 2017, Rosenstein suggested secretly recording the president and invoking the 25th Amendment to replace him. McCabe memorialized discussions he had with Rosenstein and other senior officials in the stress-packed days immediately after James Comey's firing as FBI director. At that moment, the FBI was deeply suspicious of Rosenstein's role in the decision, and the Justice Department was worried that it had lost credibility with Congress for giving Trump a memo that said the FBI needed new leadership. Others involved in those May 2017 discussions said Rosenstein's comments about secretly recording the president were sarcastic and came as McCabe was pressing the Justice Department to investigate the president's firing of Comey as possible obstruction of justice. In statements Friday, Rosenstein denied that he ever seriously contemplated secretly recording Trump or pursuing the 25th Amendment to replace the president, as was first reported by the New York Times. In a second statement hours later, Rosenstein said: "I never pursued or authorized recording the president and any suggestion that I have ever advocated for the removal of the President is absolutely false." That second statement was issued after a tense meeting at the White House between Rosenstein and Kelly, according to people familiar with the encounter. Those people said Kelly had urged Rosenstein to issue a more forceful denial, and officials in the White House and the Justice Department said they thought the second statement was in some ways weaker than the first - putting Rosenstein on even thinner ice. For more than a year, Trump's comments about the Russia investigation have fueled demands on the right that Rosenstein be forced out of his job - countered by alarm on the left that his removal would signal a collapse of the traditional independence of the Justice Department. Trump congressional allies who have been hammering Rosenstein over access to Justice Department documents, including McCabe's memos, said reports that he might resign or be fired highlight their need to see such documents. "The latest reports on Rod Rosenstein underscore the desperate need for transparency at the DOJ," Rep. Mark Meadows, R-N.C., wrote in a tweet Monday. "Release the documents. Declassify everything. Stop the games and show Americans the truth about this Russia investigation. If they have nothing to hide, they should act like it." Meadows and Rep. Jim Jordan, R-Ohio, have also called for Rosenstein to come back to Capitol Hill to testify this week, as the House is set to break for the campaign season soon. "We've got to have Rod Rosenstein in front of the Judiciary Committee answering questions," Jordan said in an interview. That makes it unlikely that Rosenstein will head to Capitol Hill before his expected meeting with Trump on Thursday to discuss his fate. Democrats said Rosenstein should hang tough. "Under no circumstances should Rod Rosenstein resign," Adam B. Schiff of California, the ranking Democrat on the House Intelligence Committee, wrote in a tweet. "This would place the Mueller investigation in even greater jeopardy. Rosenstein should continue to do his job, protect the independence of the DOJ, and if the President intends to obstruct justice, force Trump to fire him." Rosenstein, a Republican and career Justice Department official who served under Presidents George W. Bush and Barack Obama, came into office on a wave of bipartisan support, but Comey was fired soon afterward, and Rosenstein was immediately drawn into fierce partisan battles surrounding the Russia inquiry. 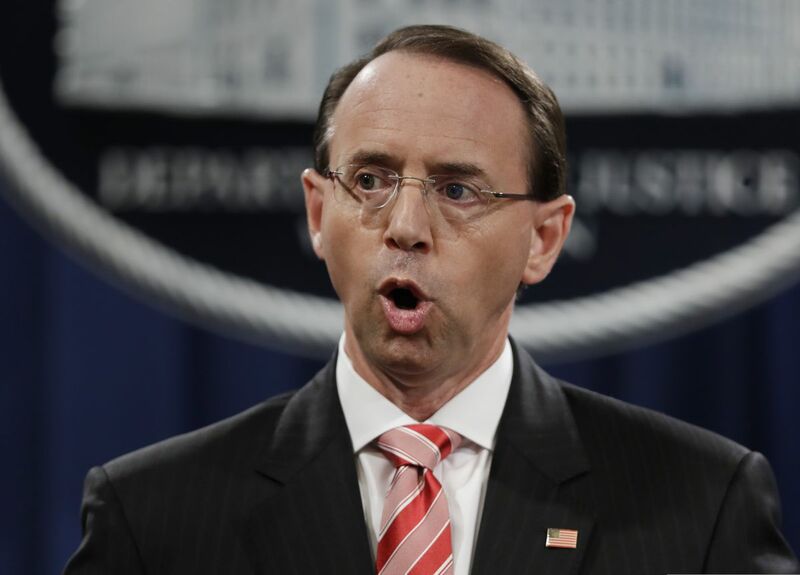 Rosenstein became deputy attorney general in April 2017 and assumed oversight of Mueller's investigation after Attorney General Jeff Sessions - who did not disclose to Congress that he had met during the 2016 campaign with Russia's ambassador to the United States - recused himself from the inquiry involving the election. Just days into his job as the No. 2 official at the Justice Department, Rosenstein wrote a memo criticizing Comey's handling of the earlier investigation of Hillary Clinton's use of a private email server for government work when she was secretary of state. The White House used Rosenstein's memo to justify Comey's firing. Days later, Rosenstein appointed Mueller, and the special counsel has since been examining the firing of Comey and whether it was part of a pattern of behavior that amounts to obstruction of justice by the president. The Washington Post’s Karoun Demirjian, Josh Dawsey, Robert Costa, Sari Horwitz, Matt Zapotosky and Robert Barness contributed to this report.